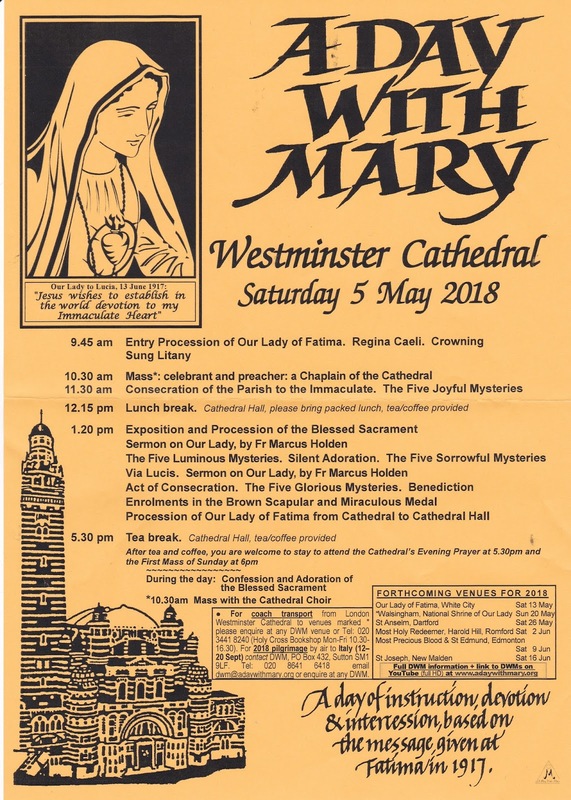 Special Sunday - 11am Today: The music for this Mass will be: Ordinary - Missa brevis (Andrea Gabrieli); Offertory – Ego flos campi (Alonso Lobo); Communion – Ego sum panis vivus (Juan Esquivel); After Last Gospel - Regina caeli (Francisco Guerrero). Music provided by Cantores Missæ under the direction of Charles Finch. 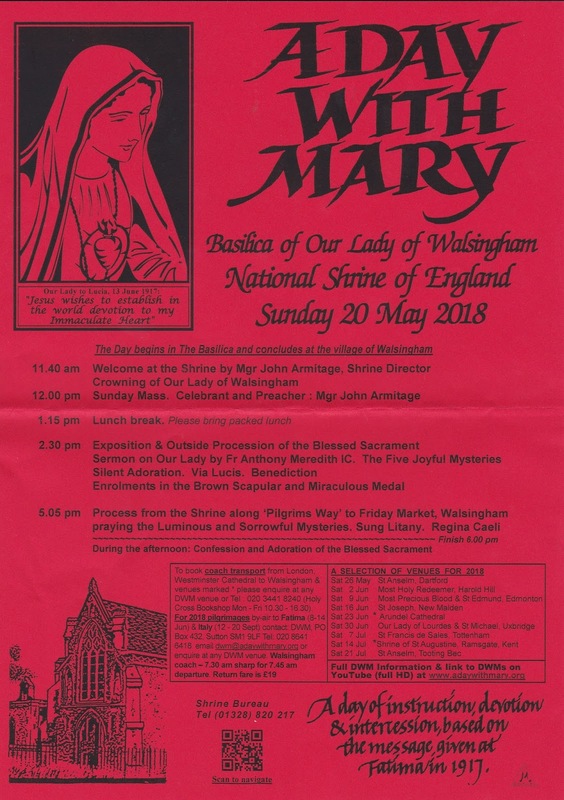 The next Special Sunday will be 20th May – Pentecost Sunday. Margaret Howard: celebrated 8 decades last week and Clare Corcoran and fr CB represented St Bede’s at the reception in the Catholic Church hall in Rottingdean. Lourdes: Mgr Leo, Fr Przemek and 40 others returned safely. 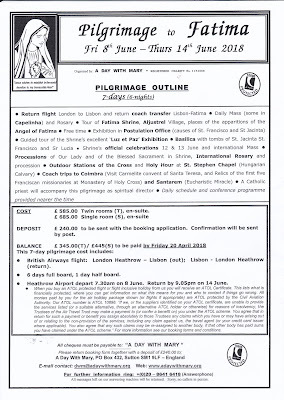 Former Polish Priests: fr Bogdan Buksa (at St Bede’s 2004-05) and Fr Maciek Wygnanski (at St Bede’s 2013-14) were both in touch and the former hopes to visit us next year from Cape Town. Pray for Vocations: At St Bede’s we are uniquely lucky to have a lot of priests and sisters but elsewhere throughout the land they are an “endangered species”. This Sunday is “Good Shepherd Sunday” in the Old Rite and next Sunday we mark it in the New Rite Masses. Our Sisters have asked us to think and pray imaginatively for vocations. Any ideas? Welcome Back: to all of our staff and pupils. We hope you all had a restful Easter break and are ready for the next term! 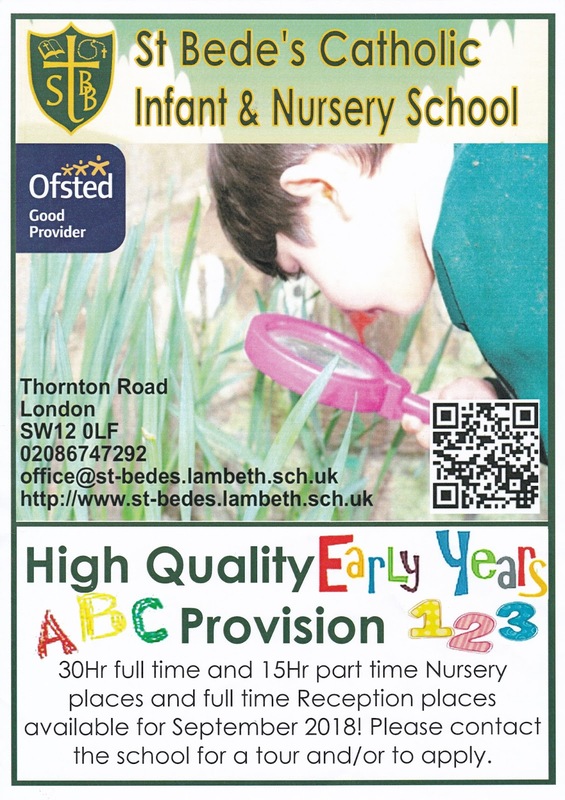 St Bede's School: Places available for the Nursery - 30 hour full time / 15 hour part time and Reception - full time starting September 2018. 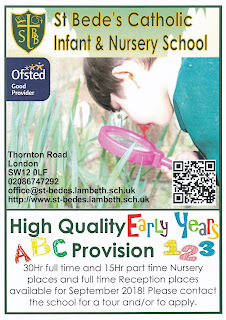 Please contact the school for a tour and/or to apply. Please see posters for more information. 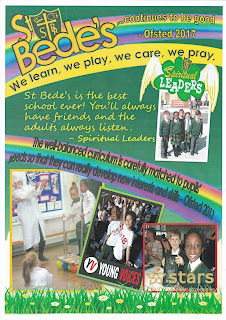 Sunday 22nd: 4.30pm Youth Club begins again. Sunday 10th & 17th 1pm FHC. Sat 23rd 6pm Reunion Mass for FHC & Confirmation. Sunday 24th 3pm Corpus Christi Procession. New Data Protection Legislation: As you may all be aware there is some new data protection legislation coming into force on 25th May 2018, which is going to impact on all of us. One of the responsibilities we will now have to undertake is to know who has access to the vast amount of personal information we hold in the parish. 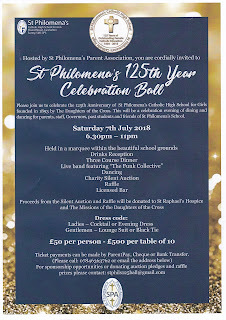 I know that a great number of you currently volunteer for the parish or may have done so in the past and may have some personal information at your home in a file and/or on a PC or laptop. 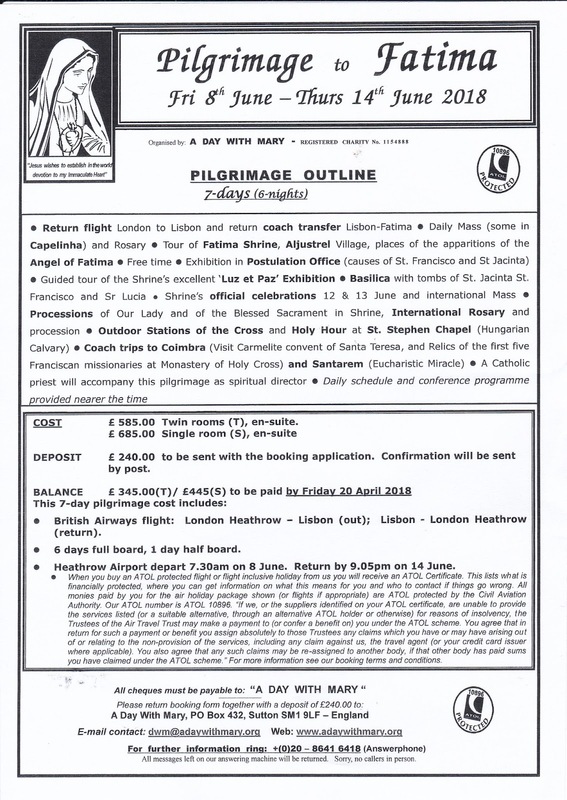 Please could you let either fr Chris or fr Przemek know if this applies to you so that we can let you know what actions you will need to take going forward. The Archbishop is encouraging all of us to help implement these changes and we thank you in advance for your co-operation. CCF Golden Jubilee: 1968-2018: The Centre for Catholic Formation will be 50 years old this summer and a lecture series has been arranged as part of our celebrations. 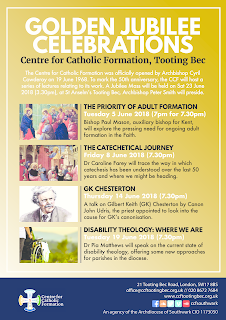 All are welcome to attend one or all of four evening talks on key themes: Bishop Paul Mason on adult formation (5 June); Dr Caroline Farey on catechesis (8 June); Canon John Udris on GK Chesterton (14 June) and Dr Pia Matthews on Disability Theology (19 June). 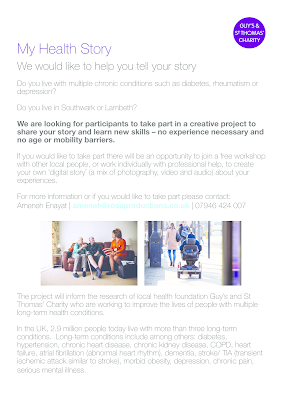 To book your place: www.ccftootingbec.org.uk/fifty or call 020 8672 7684; email: office@ccftootingbec.org.uk. NB The talks have a limited capacity (100 spaces) so we advise booking soon. There will be a Mass (with Archbishop Peter) on Saturday 23 June at 3.30pm at St Anselm’s Church – with refreshments thereafter in the CCF. 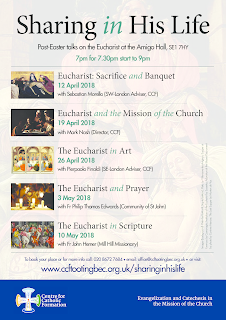 For parishioners keen to receive our information and view the videos/resources we create: The diocesan Centre for Catholic Formation regularly hosts talks, events and training. 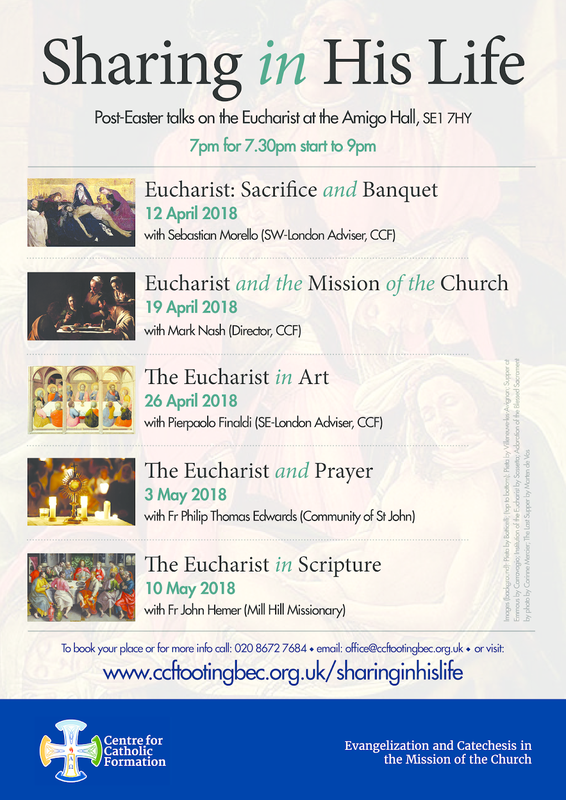 If you would like to receive information on these events and much more, please consider subscribing to our monthly newsletter: http://eepurl.com/daX7t9 - Like us on Facebook: www.facebook.com/ccfsouthwark - Follow us on Twitter: https://twitter.com/ccfsouthwark and view our videos here: https://goo.gl/yqAzN7. 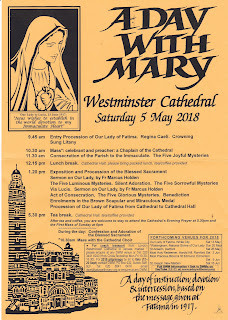 A Day with Mary - Saturday 5th May at Westminster Cathedral. Sun 20th May at Basilica of Our Lady of Walsingham. See posters at back.